French Riviera Convertible Cardigan. 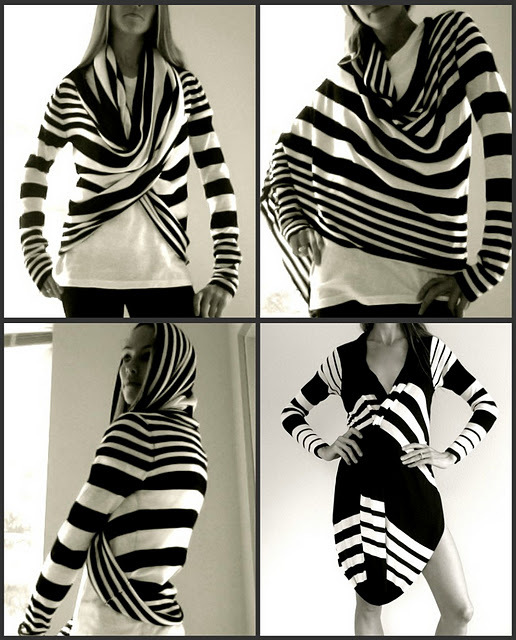 I designed this pattern so that it can be worn up to 8 different ways which makes it the perfect vacation piece. Drape, hood, flip, twist, wrap...so comfy! I looveee this! and I am totally interested in the small! my email is courtneylosch85@msn.com, I dont actually have my blog set up yet! I would love to know how to make this or where to get this? It's so adorable! I love that it can be worn so many different ways! Do you have a tutorial for this? Or do you sell patterns? found you on pinterest, awesome blog! Yes! Please post a tutorial! I freaking LOVE it. Please please please post a tut on this! I am absolutely in LOVE with this!! Yes, please post a tutorial (or sell me the pattern?)! I stumbled upon your other post on Pinterest that led me here and I cannot stop thinking about it! My dear, this blog is fantastic. It would go viral on Tumblr. how much are they? do you have any in Pink? and do you make them for kids as well? yeah, this is freaking amazing!!! looking forward to a tute!!! For those of us who just aren't talented, or inclined, enough to make one for ourselves...will you be selling them? I would love to buy one from you. We're about the same size. You can email me if this is something you would consider. Where do you sell them through??? I'd be interested in ivory or black! Found you on pinterest and love everything! I would be up for buying an ivory one! Just tell me where you're selling! :D I may have to buy your dolman tee too... I'm having such terrible luck trying to make one! Of course a sewing machine is ideal, just not available! I would definitely wear something like this, being Muslim it has a very modest look to it and very chic. YAY! I am so excited, thank you, thank you, thank you! I will be purchasing the pattern once it goes up for sale - keep us updated! I can't wait to get this pattern! Your projects are amazing. I love them. You are very talented. When do you think you will have the pattern ready to sell! I have been waiting for this pattern! Love your work. What format do you have it in currently? I might be able to help with the conversion to PDF. I love this! I would make this in a heart beat! Its gorgeous, is there a pattern I could buy? working on the pattern...I promise! I am a graphicdesigner and sparetime DIY'er and would LOVE to help you turning this adorable Pattern into a printable PDF! I have all the programms needed. Please contact me: lureki (at) web (dot) de. please please make a pattern available! Just wondering if you are almost done with the pattern! I check back on your blog often. I've found the perfect material to use, but am wondering how much I will need! Thank you so much for your time! Amazing convertible cardigan! I am entering now and then just to see if and where I can buy this pattern. LOVE IT, your are very talented, can't wait for the pattern! Hi there, is this pattern for sale or available yet? Would this pattern be available yet? Is this pattern still available in any way?